The new church fiscal year has begun. At the beginning of a new calendar year we tend to make new year commitments to pray more, read our Bibles more, give more to the church, lose weight, exercise more, buy less, and the list goes on and on. We have every intention to do these things, but as the weeks go by, we find ourselves slipping back into the same old patterns and routines. You may be asking yourself, what does this have to do with stewardship? After all it was my choice and my decision so if I don’t follow through what difference does it make? While some things may not matter, others do. In Malachi 3:10 God commands us to return tithes and offerings. He clearly states that by not doing so we are robbing God. While there is a stipulated amount of 10% for tithe, there is no set amount for offerings. We are to return offerings to manifest our gratitude and love for God. As we prepare for each Sabbath day, there are a number of things we do beforehand – things like cleaning, cooking, baking, preparing our clothes along with other chores. We decompress from the worldly things and set our minds and hearts on Godly things so we are ready to fully enjoy the Sabbath. Shouldn’t we do likewise by preparing our tithe and offerings ahead of the Sabbath day? We shouldn’t wait until we get to church to decide what to return or see what is left after all bills are paid and purchases are made. In Biblical times tithes and offerings were given off the top; they were the first fruits of the labor and not what was left. I challenge each one to set aside the tithe and offerings well in advance of coming to church. Pray about it and trust God to bless as you commit to increasing your offerings. 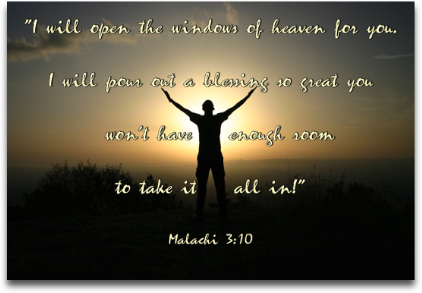 After all he does tell us that He will open the floodgates with blessing – don’t cheat yourself out of those blessings.